Ken celebrates a relilient house plant. 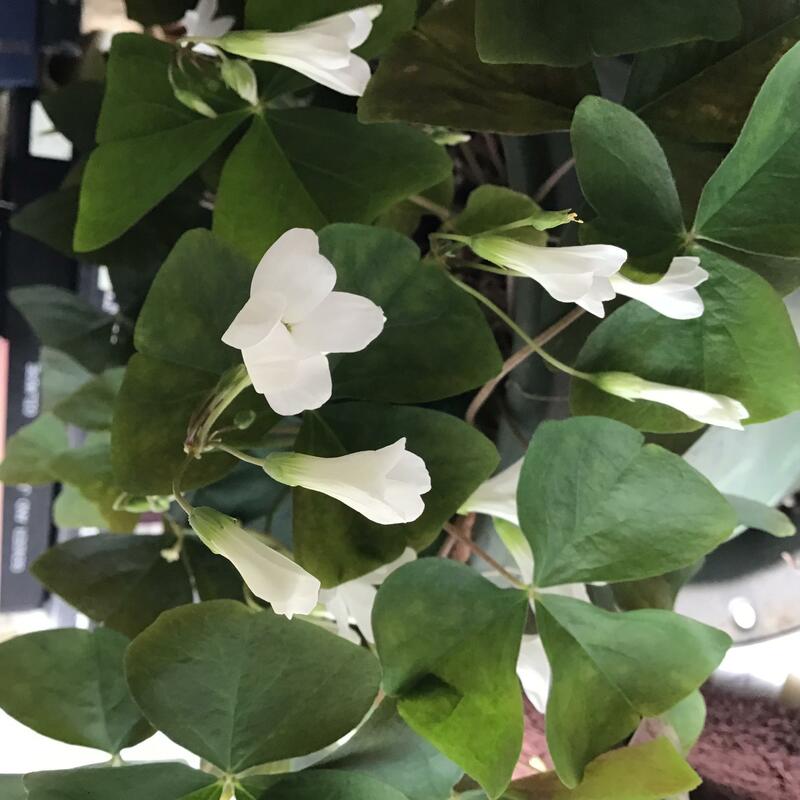 Forty years ago, on a spring day much like the ones we’ve longed for since December, my college friends Colleen and Jeff packed up their U-Haul and drove off, leaving me standing in their driveway holding their houseplant, an oxalis. I didn’t know that a person could own one potted plant across an entire lifetime. But now, four decades later, that same oxalis has spent the winter in our south-facing upstairs window, waiting like us, for spring, when it can go back outside. If you don’t know oxalis, begin by imagining a shamrock, but with these differences. At the base, standing up from the soil, picture a cluster of bumpy, skinny stumps a little like the smallest alien space potatoes. I believe these ugly spuds are called rhizomes. From their tops, pale, fragile stalks as slender as pencil lead rise several inches toward the best light. At the tips of each of these endlessly swayable stalks, a trio of green, triangular leaflets anchor and pivot. They are obtriangular. That means that the triangles anchor themselves at their apex, not their base, which gets you the cloverish, shamrocky look. These trios of green triangles fold down at night and lift themselves toward the window in the morning. The plants are brilliantly adapted to human society. When I was younger my roommate used to kick over the oxalis two or three times a year. The rhizomes would come loose from the soil and the leaflets would swoon, but it didn’t matter. Tamped back into the soil, they would be themselves by morning. But that’s not the half of it. In direct sunlight, oxalis droops, and in deep shade it slowly loses its can-do spirit, so oxalis teaches the least observant plant owner to keep it near a bright window, just out of the sun. Water too often and the leaflets go yellow and brown like many another plant. But best of all, when the good loose soil starts drying out, the leaflets quietly relax and hang down. Time to water me, they signal to the least observant human. Just with those responsive three-part leaves, the oxalis teaches you everything you need to know about keeping it alive. Only the most self-absorbed, distracted plant owner can kill it. The leaves are a thin, soft, green fabric that is cool to the touch, like a little magical being always ready to remind you, through your fingertips, that the world has more wonders than are dreamed of in your philosophy, Horatio. In good bright light, white flowers grow in clusters and tilt toward the window for weeks and weeks. Put outside over the summer in the brightest shady spot, the plant will multiply itself two and three and four times before it’s ready to come back indoors in the fall. Oxalis makes nature seem easy. If you live with an oxalis plant, you’ll feel like you have a green thumb. If you buy an oxalis for your favorite ten-year-old niece or nephew today, he or she will still be thinking grateful thoughts of you, and wise thoughts about resilience and beauty, while watering the dear thing seventy years from now. I only know this one plant well, but I am persuaded of something by my hardy, instructive oxalis. As we, if we, when we gather our will and moral force, dear listeners, all of us, and get serious about observing nature, about the burden of human food and waste systems on the planet, and about climate change, I see from this modest enduring plant that we could learn together what we need to learn in order to build not a self-deceiving but a serious and honest hope. I confess, I was seated at my mother’s dining room table not far from a big tin of Christmas cookies. There were tell-tale shortbread crumbs near me on the purple tablecloth, and a bottomless cup of coffee. From the living room TV came the muffled thunder of volume-turned-low Ghosts of Christmas Past, then Present, then Future, each one Hollywood made wilder that the last, but I ignored them. Much more interesting spirits were spread around us on the table. Not the cookies. We were sorting through a big box of family photos. Used to be you’d hear about news first by turning on the news. But this week’s “Stay in your Lane” episode unfolded on Twitter a day before it jumped to traditional magazine and radio journalism. However, none of it involved the ordinary way we use those four emphatic words.